A few posts ago in ‘The Owl and the Woodpecker‘ I mentioned that a pair of robins may have started getting fruity in my garden as early as the begining of January. And then last Friday I saw another robin feeding a fledgling on the grass outside work, so it looks as though the avian breeding cycle may have been able to start early this year. I hope it has, and that it allows other species to recover some of their numbers too. Also in that post, I talked about our local barn owls, of which we had two breeding pairs in and around the village last year. And one gloriously sunny evening in July myself and my daughter, Sophie, set off across the fields with a portable hide, binoculars and a camera to try to see the owls and take some photographs. I know where the owls nest so we tried to get in position to see them heading to and from the nest site via a circuitous route to avoid disturbing them. We eventually found a spot at the top of a drainage ditch between two fields around 150m from the shed where the owls had built the nest, and we didn’t have to wait long for them to appear. 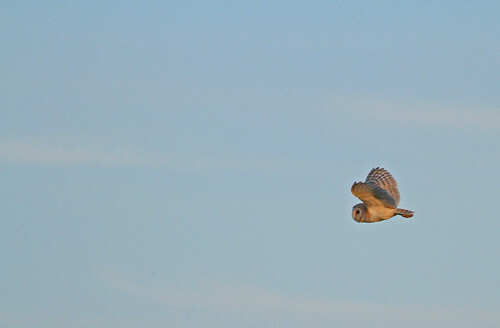 Truth be told I’ve always had a thing about all owls, but especially barn owls. I think they’re beautiful and iconic creatures, and very reminiscent of warm summers evenings in the English countryside. It’s always an exciting moment when I catch sight of one. We sat and watched them coming and going for about an hour and in that time they arrived 6 times with prey. So on average every 10 minutes one of the parents returned with a meal for a youngster, this one was carrying a rodent in its talons which it delivered to the nest, spent a couple of minutes with the youngsters, then departed on the next foray. And they carried on hunting into the dusk at which point we upped sticks and headed for home. I don’t know how long the owls carried on hunting but the parents seemed to be so successful that they may not have needed to carry on for much longer, after which they would have spent the night at a roost site separate from the nest with the youngsters in. It was a glorious evening and Sophie was beside herself as one of the owls flew right overhead and looked straight at her, as barn owls are wont to do, as she looked straight at it. A memory that will stay with me, and her I hope, for a very long time! As I started to write this post there was some interesting robin behaviour going on in the garden. Robins (Erithacus rubecula, Dansk: rødhals) are fiercely territorial and will kill each other to defend their patch and I often see them chasing off not just other robins but any bird smaller than a blackbird (Turdus merula, Dansk: solsort)! But just now there was a pair being relatively nice to each other and even sharing the same feeder. So I’m wondering if these two were a pair beginning to contemplate the imminent breeding season, as early as January the 12th. The weather has been much warmer than the previous three winters so maybe they are already thinking of making up for lost time. But I began with a digression, so now to get back on message. I’ve been dithering about writing this post for a few days but I was finally inspired to start when I saw some recent posts on the blog of a good blogging friend, Gary, from ‘Krikitarts‘ (if you haven’t seen Krikarts yet make sure you check it out, it’s very, very, good!). 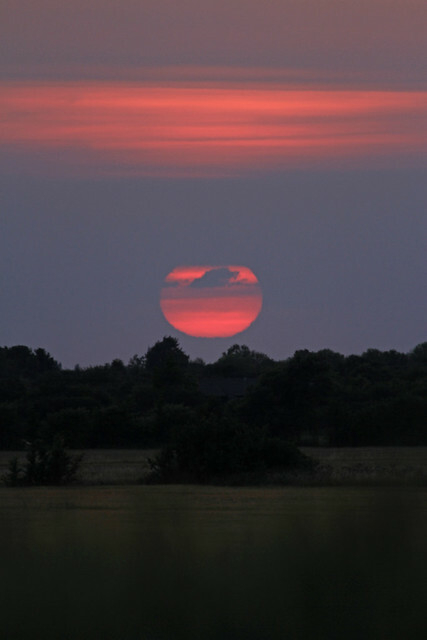 Gary’s posts included pictures of skies and rainbows which were digitally reproduced form the original slides. 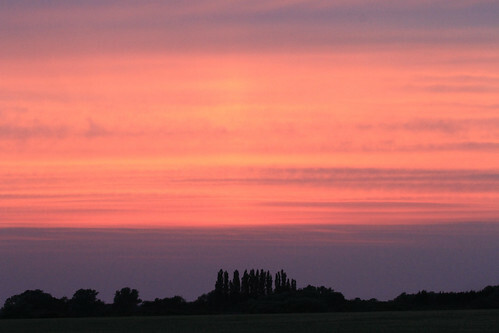 And seeing these spectacular images spurred me on to get this post written to show you some evening skies from Cambridgshire in summertime. 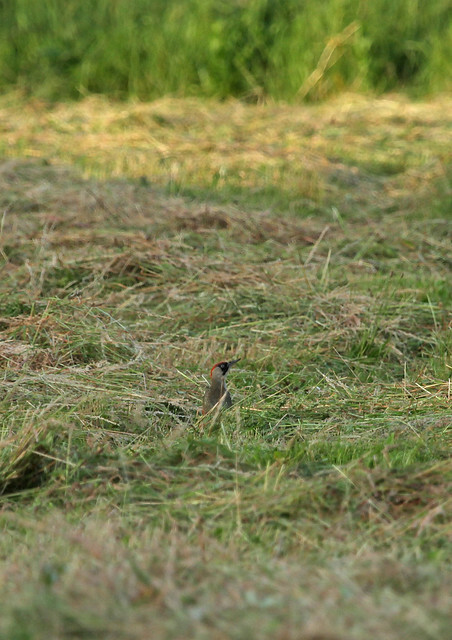 Whilst many bird species have been on the decline, the green woodpecker seems to be thriving, at least in my part of the world. I see them around the village, in the trees and on the ground around work, and on the way to work too, and I’ve heard they are generally doing OK. They’re handsone, colourful, creatures and it’s good to see them coping well with all the insults humans throw at them. 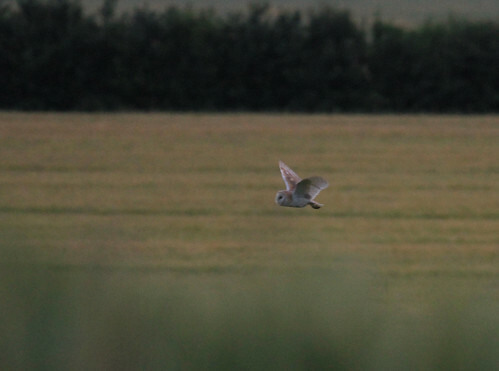 And as the sun got lower and plunged us into the crepuscular phase twixt day and night, a barn owl (Tyto alba, Dansk: slørugle) was quartering the fields looking for rodents. Barn owls were hit really hard by the previous three bitterly cold winters and then by the brutal wet and cold weather last spring. 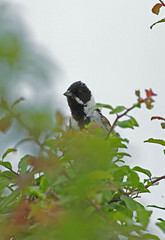 But we had at least two breeding pairs in Histon and this individual was half of one of those pairs. Bearing in mind the precipitous decline in barn owl numbers in the UK and beyond, I think that makes Histon an important place for them. I don’t know how many chicks were fledged but I’m hoping some survive the cold weather holds off this year and we get more breeding pairs in 2014. 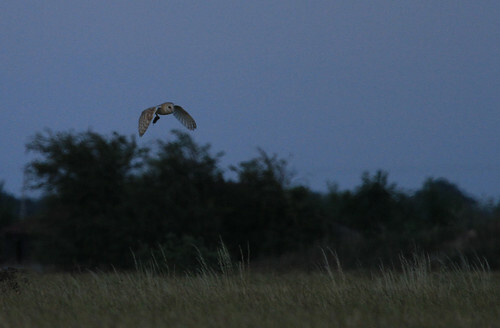 Barn owls are great to watch. I know the routes they take in the fields local to here and when I see them coming I can crouch down and often, but not always, they fly slowly right over my head, around 10-15 feet up, and sometimes we eyeball each other and I wonder what they’re thnking. Of which more in another post in the near future. In my last post I wrote about the wildlife to the north of Histon. This post is about the wildlife to the west of the village. The two areas are divided by a main road and they are quite different in character. The north is very open with big open fields lined with ditches and hedgerows and the west has more trees and scrub. 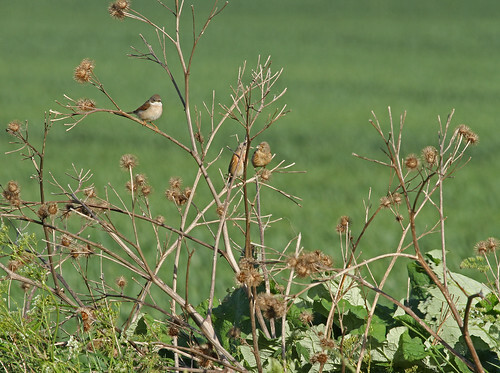 In mid June I ventured there to compare the birdlife with that to the north, because I normally see less farmland birds like skylark, corn bunting and yellowhammer here, but more finches and migrant warblers like chiffchaff, willow warbler and whitethroat. 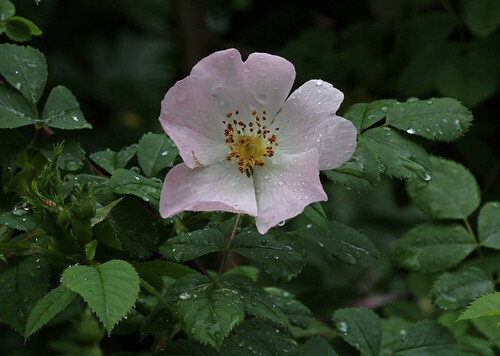 There had been a refreshing shower shortly before I set out which had left the flowers on a rose bush bejewelled with raindrops. 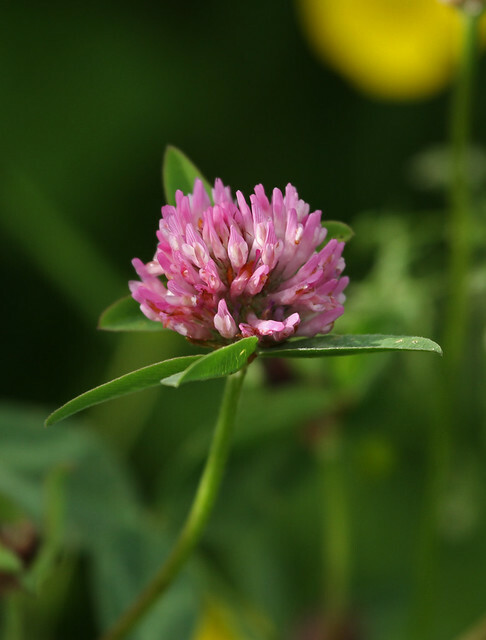 It was a good time of year for the wild flowers as the ground had not dried out and there was plenty of sunshine. And of course, if the wild flowers are in good shape, there’s plenty of food for insects and therefore abundant sustenance for birds too. 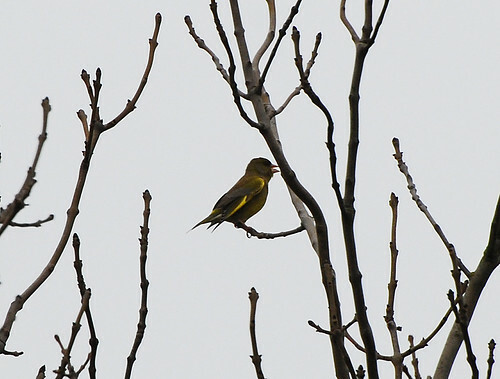 The linnet (Carduelis cannabina, Dansk: tornirisk) were omnipresent here throughout the summer, and occasionally a yellowhammer (Emberiza citrinella, Dansk: gulspurv) appeared too. 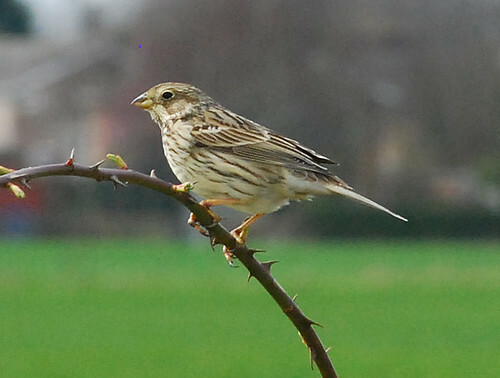 It’s easy to find yellowhammers if they’re in residence because of their characteristic song (a-little-bit-of-bread-with-no-cheese). 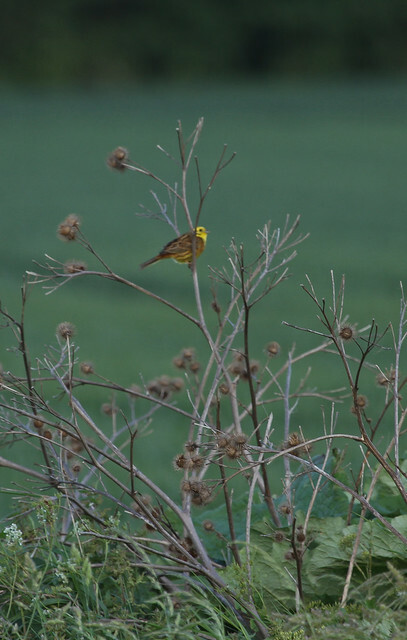 And the yellowhammer song carries on the wind for hundreds of metres and because they are so colourful they’re easy to spot with a pair of binoculars. At least one pair of whitethroat (Sylvia communis, Dansk: tornsanger) were nesting on the edge of this field too. 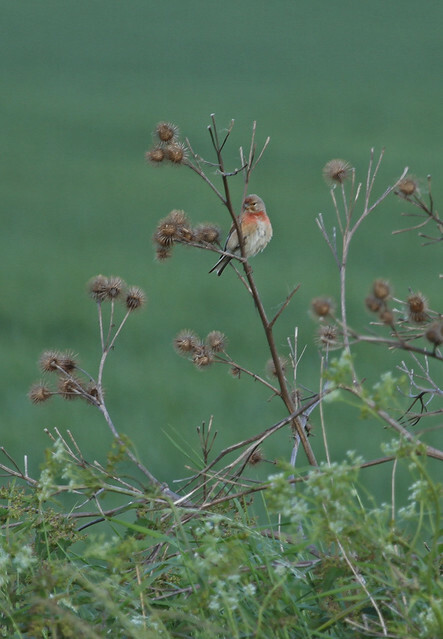 The whitethroat are amber listed and the conservation status of the linnet and the yellowhammer is red list due to decline in their numbers. And in a very old oak tree just a few metres from here was a pair of barn owls (Tyto alba, Dansk: slørugle) nesting, and their status is also amber, but more about those in a later post. Every now and again there is a piece of good news regarding the survival of a particular species. Yesterday on the BBC news website was just such a story. It concerned the resurgence of barn owls (Tyto alba, Dansk: slørugle) in the Trossachs around Loch Lomond in Scotland. Watching barn owls silently quartering fields on a warm summers evening is a rare treat and getting rarer, so it was good to hear that in this area the numbers of field voles (Microtus agrestis) have rocketed by up to ten fold, which has led to a concommitant increase in the breeding success of the local barn owls. Paradoxically, the reason the vole population exploded was the long freezing winters we had last year and the year before, in which large numbers of barn owls perished, but the voles were able to avoid the worst of the cold and move around by tunnelling under the snow and thereby avoid detection by airborn predators. It was also interesting to read that the owls were maximising the benefit of the vole surplus by storing slaughtered prey in owl boxes, with up to 15 dead rodents in a single box. 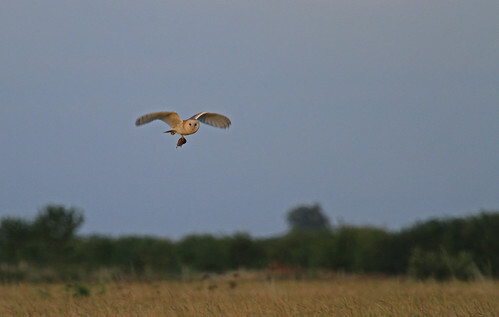 Hopefully vole numbers will continue to remain high and barn owl numbers can recover even further. 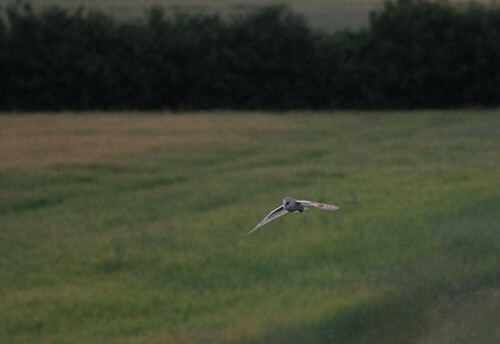 If anyone has heard similar reports about barn owl numbers in other parts of the country please let me know. This weekend I’ve been out and about on my regular walks north of Histon. (Click here for a sketch map of the locality). Yesterday I was out around the fields to the north between Histon and Cottenham. It was a cold grey morning and it was noteworthy for several reasons. It was the first one this year and the first of several we spotted yesterday. It was a good morning for buntings in general. Last time I was here, around three weeks ago a mixed flock of reed bunting and yellowhammer were in the east end of the Owl Shed Hedge (see post from 29th Jan entitled “Buntings abound: 29th and 30th January 2011“). 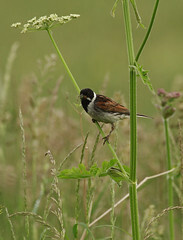 They were there again on Saturday and reed bunting were present in most of the hedges and ditches we peered into. 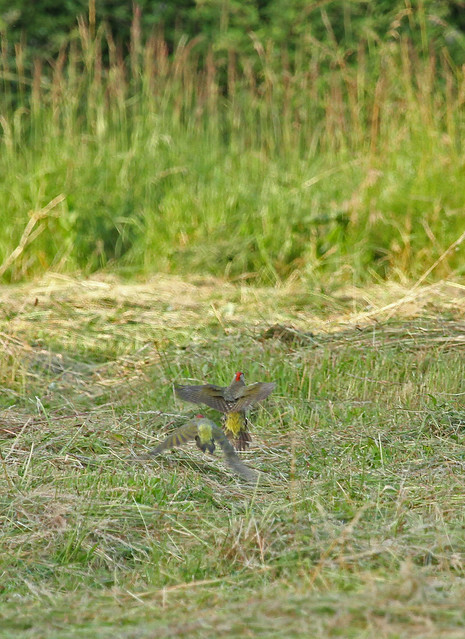 Skylark were present in large numbers too, singing up high and darting around low. A look on the floor of the Old Water Pump, which has a platform for barn owls to roost and breed, revealed numerous owl pellets most of which were very old, but some of them looked fresher, possibly from within the last 6 months. This is a very good thing as barn owls haven’t bred there since 2008 and I haven’t seen one in the vicinity since last year, and then only a couple of sightings all year. Other appearances which livened up the walk were a muntjac deer, Muntiacus reevesi, introduced from China to the UK in the first half of the 20th century, which was rooting around at the back of the gardens of the houses on Cottenham Road, and a stock dove was sitting in the trees in the same area. I may have seen these before and mistaken them for wood pigeon, but David’s expert knowledge put me straight on the differences. They don’t have the white neck and wing bands of the wood pigeon and they have a dark eye which is diagnostic – that of the wood pigeon is lighter. 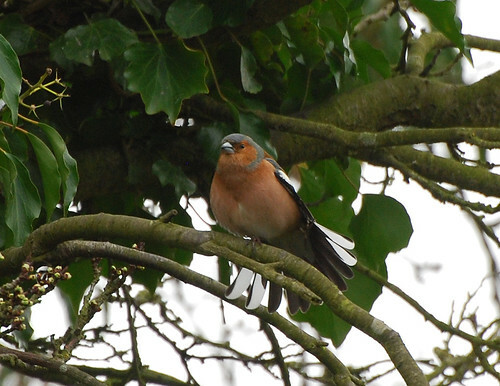 …and a chaffinch male displaying his gorgeous black and white tail in a fan. I’ve posted a few photographs of chaffinch lately, even though they’re common I think they’re spectacular! A couple of surprises today, firstly the number of bullfinch; I saw a single male in Rowleys Meadow which may have had a female with it but I couldn’t see it well enough to confirm, and another pair of males flew along Guns Lane hopping from hedge to hedge infront of me for 50-100m. And secondly, the number of dunnock. 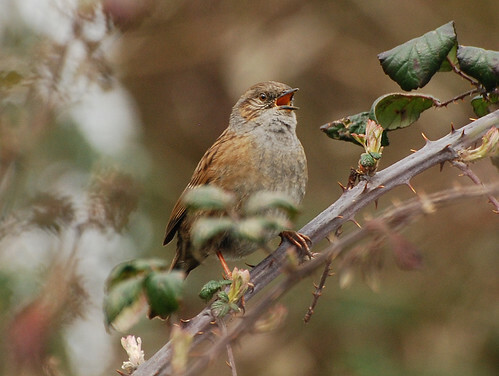 They were present in every bush and bramble in the Meadow and on the Lane singing constantly – if you haven’t heard dunnock song, have a listen here, it’s lovely. Dunnock have a rather interesting approach to breeding. They don’t pair off as most birds do, a female will be mated by at least two males who will stimulate the females to eject a rivals sperm from the cloaca with their beak. DNA analysis has shown young in the same clutch can have more than one father. I like dunnock, they look boringly grey/brown when seen flitting around the undergrowth, but when they catch the light they are certainly not drab. And their song and their antics at breeding time are anything but boring! 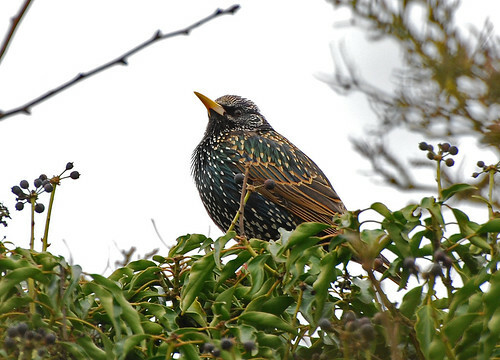 The glorious plumage of the starling! 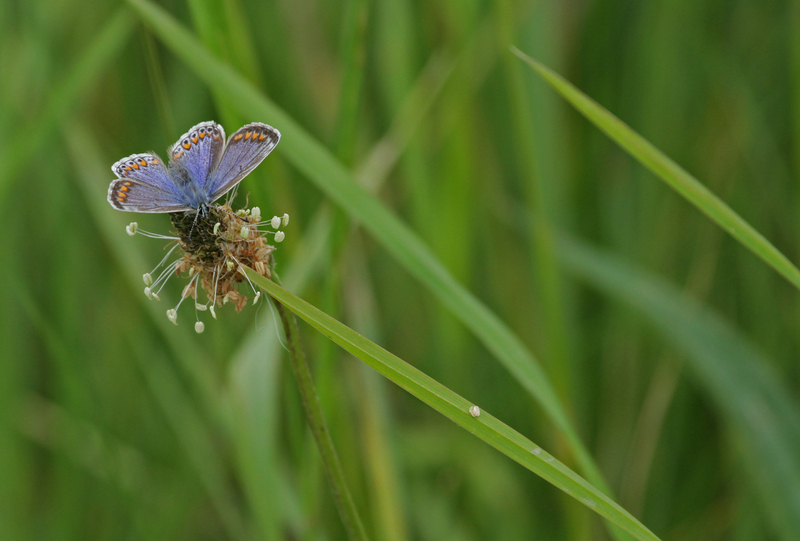 Spring is well underway now and the activities of the wildlife are reflecting that. It’s a great time to be poking around in the woods and hedgerows.